The kind people at Cultural Heritage and Action Team, a voluntary organisation formed by Penang heritage groups and activists have created this infographic for those interested in the architecture and history of heritage buildings in Penang. 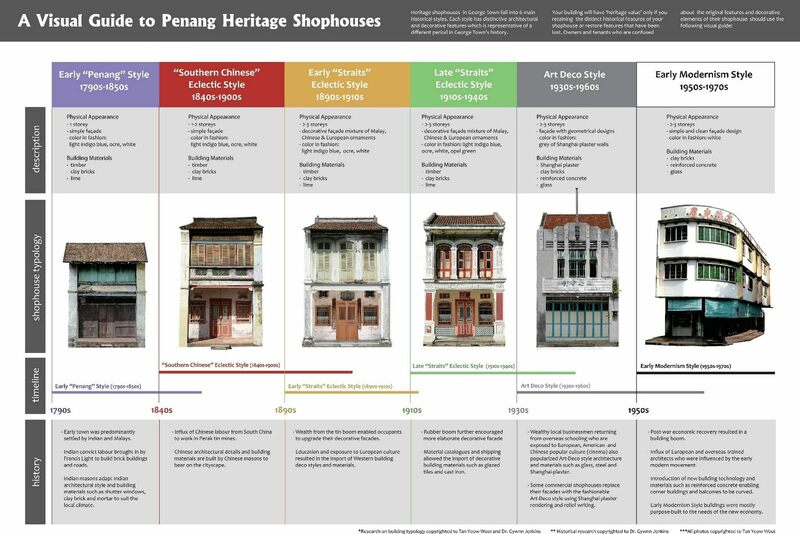 The infographic entitled “A Visual Guide to Penang Heritage Shophouses” was created jointly by Dr Gywnn Jenkins and Tan Yeow Wooi with focus on the different eras in which the type of shop houses were built. They covered the early 1790s right up to 1970s, over one and a half centuries of architectural history in Penang. The eras were also categorised based on influences and styles of its day i.e. Early Penang, Southern Chinese, Early and Late Straits, Art Deco and Early Modernism. If you grew up in one of these shop houses, can you tell which of these categories it belonged to? Click on the image above to open a full size version.